CP-FS credential holders may be employed in any retail food environment — as a quality assurance or quality control manager, facility manager, food-safe chemical supplier, or in a more traditional food safety position such as a regulatory inspector/investigator. 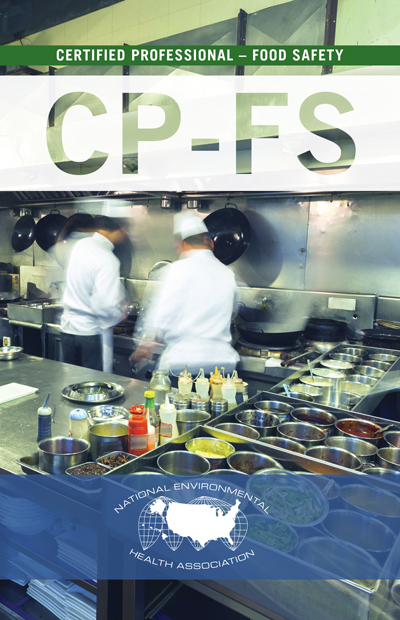 CP-FS holders are able to conduct facility plan reviews, evaluate hazard analysis and critical control points (HACCP) plans or other risk-based food safety programs, understand the causes and prevention of foodborne illnesses, and analyze and implement sanitation standard operating procedures for safety and effectiveness. Associate’s degree and 4 years of experience, and a valid, unexpired Certified Professional Food Manager (CPFM) certificate, Food Safety Managers Certification Examination (FSMCE) certificate, SuperSafe Mark certificate, OR a ServSafe Food Protection Manager certificate. High School Diploma and 5 years of experience, and a valid, unexpired Certified Professional Food Manager (CPFM) certificate, Food Safety Managers Certification Examination (FSMCE) certificate, SuperSafe Mark certificate, OR a ServSafe Food Protection Manager certificate. This information is a brief overview of the eligibility requirements. For complete details, please see the Candidate Information Brochure (CIB) for more information. NEHA developed the CP-FS credential to meet the growing need for professionals who have specialized knowledge and training in the protection and safety of food. The importance of food safety is recognized along the continuum of training from food handler to food safety manager, and the next step for professionals who want to advance their careers in food safety is obtaining the CP-FS credential. The CP-FS credential is designed for individuals within the public and private sectors who have prior food safety experience, and it integrates food microbiology, HACCP principles, and regulatory requirements to validate problem solving and knowledge expertise using real-world examples. This prestigious credential is well respected throughout the industry, and is highly valued by employers when hiring food safety professionals. "A CP-FS credential is for individuals within the public and private sectors who have prior food safety experience, and it integrates food microbiology, HACCP principles, and regulatory requirements." "My CP-FS credential has allowed regulatory agencies to look at me as a peer and has opened doors professionally to me. Industry has hired me because I have these credentials under my belt." "The CP-FS credential has allowed me to be very competitive when applying for senior level Environmental Health positions. " "The CP-FS credential has given me a sense of pride to know I possess a credential which demonstrates a subject matter expert level in Food Safety. "